In recent days and weeks the Preston North End fans that follow the fortunes of their club on various social media platforms have latched on to a new slogan. The hashtag #teamslikepreston has become something of a badge of honour in the face of some unwarranted criticism from supporters of frustrated opposing sides. 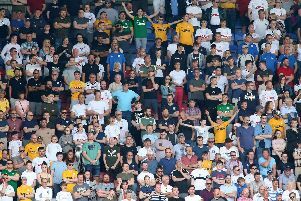 Those tweets and others have become so commonplace that Lilywhites fans have been celebrating their side’s ability to confound the odds in what has been a promising start to the new season. Even Jaap Stam got in on the act after Reading’s defeat at Deepdale last weekend. “If you play against a side like Preston you have to bring everything to the game including physique, pace, aggressiveness,” the former Manchester United defender told the media after the play-off finalists from last season showed little in a 1-0 defeat. In Stam’s case it is a comment on what he perceived to be a more physical style of play, completely at odds with his Royals side, who attempt to pass sides to death by dominating possession. The reality is, whichever way you look at it, Reading were well beaten seven days ago and should have been sent packing by an even greater scoreline. When fans coin the phrase, often lumped in with others such as Burton Albion, ‘teams like Preston’ implies a superiority complex. But why aren’t the Lilywhites getting much respect? Why are fans of other clubs expecting them to roll over and have their tummies tickled? They more than punched their weight under the previous management with back-to-back 11th-placed finishes and have made a very bright start under the guidance of Alex Neil. Perhaps it’s to do with money spent? On an almost weekly basis now North End are lining up against teams who have players worth tens of millions of pounds. That just simply won’t be the case at Deepdale in the near future. Maybe it’s to do with recent history? Preston have had to re-establish themselves in the second tier after dropping down to League One and are one of just five clubs in the Championsip who haven’t played in the Premier League. That means that week in, week out ‘teams like Preston’ are coming up against perceived big-hitters. That’s certainly been the case at the start of this season and to say Neil’s side have more than held their own would be almost an insult to them and the work they’ve done. If they hadn’t done enough to earn plaudits in the past season or two then they’ve certainly caught the eye in the first four games of the 2016-17 campaign. Sheffield Wednesday and Reading have been swept aside, while the visiting fans at Elland Road watched their side control the game for long periods against Leeds before Ben Pearson’s red card. The defeat at Derby has been the one real low point in the league with another tough test to come at Middlesbrough today. While Neil clearly has expectations of his players behind closed doors it seems he is enjoying flying under the radar when it comes to the bigger picture. But if this group takes their promise deep into the season then how far could they go? Leaving Deepdale after the Reading win, there were murmurings that, given the relatively young age of the side and the style of football being played, exciting times could be around the corner. Yes, it is a small sample size and we’ll learn even more about Neil’s PNE at the Riverside today but the signs are certainly good. A lot could rest on the final few days of the transfer window however. While fans of other clubs may find players like Jordan Hugill an annoyance and a bit of a throwback, managers in the Championship are certainly watching on with an admiring glance. A couple of swiftly rebuffed offers have come in from Birmingham, while Wolves and Ipswich have previously showed an interest in PNE’s emerging No.9. With all that is going on around him, it is a credit to the 25-year-old target-man that he has been so impressive in the opening weeks of the season, bullying Championship central defenders for fun. If Ipswich boss Mick McCarthy is to be believed there is a £6m price tag on the striker’s head. That might go up should Simon Grayson and Sunderland ever come calling. While some would seemingly still be happy to take the money, the issue at this stage of a transfer window is replacing such a key man at short notice in what is an increasingly inflated market. Hugill isn’t alone in attracting interest, bids having also come in for Callum Robinson and Greg Cunningham, and players do come and go. But keeping this group together would certainly go a long way to putting an end to the ‘teams like Preston’ moniker.